Luci made a great film which captures the can-do DIY punk spirit and shows a slice of life we seldom see in films, but should see more often, especially now as society enters into another culture war on women and the poor. 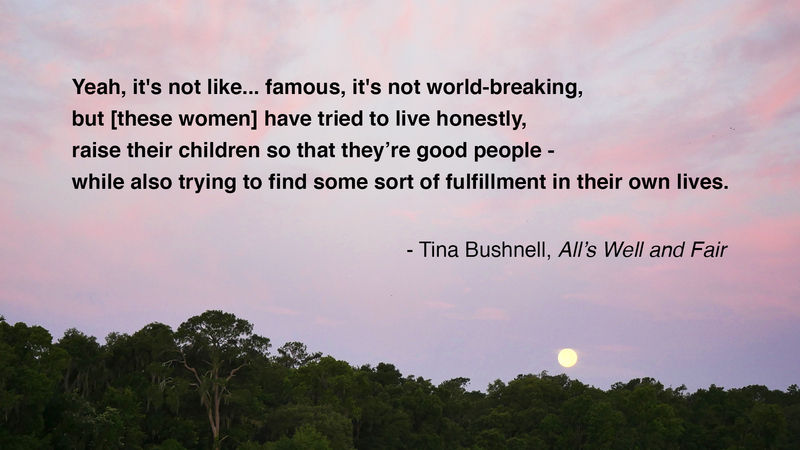 Punk, politics and parenthood are my life’s recipe, so Luci Westphal’s documentary, All’s Well and Fair, is a delicious, filling meal with a spot-on soundtrack! No matter the 90s or the 21st century, moms making music and raising kids while living meaningful, thoughtful and well-intentioned lives remains a timeless source of inspiration and reminder that life is short and growth is inevitable. Our culture is being sold to us at this point instead of us creating it for ourselves. […] We should be in our cities, in the woods and on our fields […] making the culture ourselves. But now we just watch these boxes and have it dictated to us. And it’s very sad. I don’t want that for my kids. I think raising a child, raising a son, I just couldn’t even imagine raising him any other way than just to say: look around you, look at what the women in your life have done and… yeah, it’s not like… famous, it’s not world-breaking, but they’ve tried to live honestly, raise their children so that they’re good people – while also trying to find some sort of fulfillment in their own lives… and very often have not had anyone else to rely on but themselves.